Universities in the Great Lakes region (states bordered on the Great Lakes/in the Great Lakes watershed) with expertise in the research focus areas may be offered affiliations to partner in applicable areas. Researchers and other relevant affiliate assets from the affiliated universities are included as part of the research portfolio of the GLMRI, and the affiliate may serve as project researchers based on submitted proposals in response to an annual request for proposals. Affiliate universities meet annually with GLMRI Directors and the GLMRI Advisory Board to provide input on future research topics and to discuss current research results and process. GLMRI maintains an open and continuous dialog between affiliates to address evolving issues regarding maritime commerce. 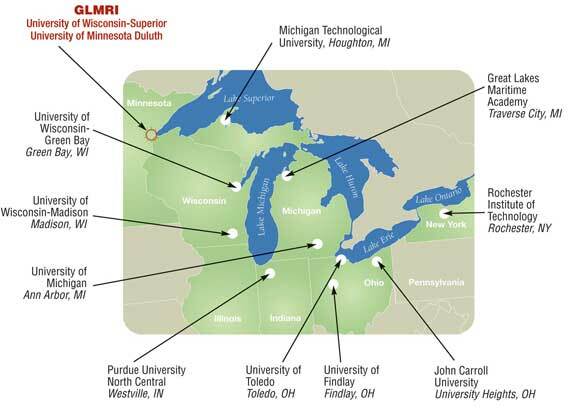 Research affiliates are encouraged to leverage GLMRI resources to secure independent and joint funding opportunities for Great Lakes maritime research. Matching funding is a significant consideration. GLMRI funding for research proposals is granted only to GLMRI University Research Affiliates, and only proposals from GLMRI University Research Affiliates will be accepted for funding consideration. Universities seeking to obtain affiliate status should provide a request to the GLMRI Program Office with details on the capabilities and assets that they would bring to support the mission of GLMRI, along with an expected interest area for future research endeavors. Requests are evaluated by the Institute co-directors for affiliate status in GLMRI. University Affiliates’ Agreements are reviewed annually. GLMRI is dedicated to developing and improving economically and environmentally sustainable maritime commerce on the Great Lakes through applied research. Specific research focus areas are updated and addressed for each annual request for proposal cycle. The All Hazards Training Center (AHTC) was established as a department within The University of Findlay in 1986 with the initiation of the Bachelor of Science in Hazardous Materials Management Degree program. A practice-based and regulatory compliance/competency-based training center was added in 1989. Today AHTC’s educational and training programs include: environmental, safety and occupational health (ES&H); emergency response; emergency management; OSHA safety; public health; homeland security; maritime security; school safety and security; and many other customized programs. AHTC’s Maritime Security program includes three courses approved by the U.S. Maritime Administration: Facility Security Officers (UNFIND-560); Maritime Security Awareness (UNFIND-561); and Maritime Security for Facility Personnel with Specific Security Duties (UNFIND-565). Additionally, AHTC has two Maritime Security courses developed for and approved by U.S. Department of Homeland Security (DHS): one is titled Port and Vessel Security for Public Safety Officials; the second is titled Small Vessel Security. To-date, AHTC has awarded Bachelor and Master degrees to more than 1,350 people through the Academic Degree Programs and through the practice-based training center, more than 170,000 people have been trained. The Great Lakes Maritime Academy (GLMA) is a division of Northwestern Michigan College (NMC). The Academy trains men and women for service as licensed Officers in the U. S. Merchant Marine. GLMA's program is unique among the state maritime academies as it is the nation's only freshwater academy. . Upon successful completion of the program graduates are qualified to sail as an Officer onboard a U. S. Merchant vessel sailing on either the oceans or the Great Lakes. All cadets will also earn a Bachelor's Of Science in Maritime Technology. The education provided at GLMA ensures employers have a steady supply of the finest maritime personnel who are fully compliant with both U.S. regulations and the Standards for Training, Certification, and Watchkeeping Code (STCW). As a condition of graduation all deck cadets are required to sit for their unlimited tonnage Third Mate (ocean) license as well as Great Lakes Pilotage. All engineering cadets are required to sit for Third Assistant Engineer, Steam and Motor Vessels of any Horsepower. William J. Sproule, Ph.D., P.E. Michigan Technological University was founded in 1885 in Houghton, Michigan, as the Michigan Mining School to train mining engineers to work in Michigan's Upper Peninsula copper and iron ore mines. Since that time the university has expended and today there are over 120 degree programs in arts, humanities, social science; business and economics; computing; engineering; forestry and environmental science; biological and physical sciences; and technology. The university has grown into a leading public research university and a key educational partner within Michigan, the nation, and beyond. In 2012, Michigan Tech opened a new Great Lakes Research Center that provides state-of-the-art laboratories to support research on a broad array of topics. Faculty from many departments across campus collaborate to conduct interdisciplinary maritime research relating to air-water interactions, biochemistry, hydrodynamics and sediment transport, fisheries, invasive species and food web relationships, low impact development, and storm water management. The Research Center contains a boathouse and convenient docking facility to provide a year round home for Michigan Tech's research vessel, the Agassiz. The Center for Science and Environmental Outreach is also housed in the new Research Center building and provides numerous programs for K-12 students and teachers and community education, and has led the development of GLMRI education/outreach programs and activities on Great Lakes maritime transportation. Students in the Department of Naval Architecture & Marine Engineering (NA&ME), at the University of Michigan, learn how to design/analyze ships and the other complex marine systems for a demanding and often harsh environment. In addition to the more traditional disciplines of naval architecture and marine engineering, we offer courses and research opportunities in offshore engineering and coastal engineering. Graduates from our program can be found in the U.S. Navy and other navies of the world, the U.S. Coast Guard, offshore companies, shipyards, marine design firms, shipping companies, research laboratories, peer academic institutions, etc. John Carroll University has offered a logistics major since 1950. Established shortly after WWII by the US Army Transportation Corps, the program is now domiciled in the Department of Management, Marketing, and Logistics. The Department is dedicated to educating and serving its students, the University, and the community through quality teaching, significant research, and appropriate community involvement with shippers and carriers. The primary goals of the logistics faculty are to achieve national recognition, and to provide students, the University, and the business community with comprehensive, up-to-date information about business logistics theory and practice. Methods of achieving these goals include, but are not limited to, excellent teaching, quality research (both academic and practitioner), student internships, and faculty/student involvement in logistics-related organizations. The Purdue University North Central College of Engineering and Technology provides degree programs in technical disciplines and engagement assistance in economic development for citizens in north central Indiana. The college has conducted research in the areas of coal transportation infrastructure, electricity distribution and control, and simulation of large scale systems. Our Great Lakes Research Program is housed in the RIT Laboratory for Environmental Computing and Decision Making (LECDM). The LECDM has as a central focus the study of freight movement, transportation logistics, environment, and cyberinfrastructure. Our goal is to improve freight-related transportation decision making by advancing and integrating environmental cyberinfrastructure tools and modeling techniques into supply chain logistics analyses. Our Great Lakes Research Program is aimed at understanding and improving the efficiency and environmental footprint of intermodal cargo flows in and around the Great Lakes. The Intermodal Transportation Institute at The University of Toledo was organized by public and private stakeholders to encourage the development of technology-enabled intermodal transportation systems and supply chains that promote economic development and quality of life. The Goals and Objectives of UT-ITI are to create an internationally recognized center of excellence; advance technology and expertise in the many disciplines comprising transportation; educate a multi-disciplinary work force; attract students, faculty, and staff in undergraduate, graduate, and professional programs; and to enhance diversity in the various fields related to transportation. The ITI was named a Center of Excellence in Logistics and Transportation by the Ohio Board of Regents. The University of Wisconsin-Green Bay (UW-Green Bay) is unique among other state universities in its emphasis on an interdisciplinary, problem-focused educational experience that prepares students to think critically and address complex issues in a multicultural and evolving world. The university enriches the quality of life for students and the community by embracing the educational value of diversity, promoting environmental sustainability, encouraging engaged citizenship and by serving as an intellectual, cultural and economic resource. UW-Green Bay's Urban and Regional Studies Program, Center for Biodiversity, and Institute for Environmental Management and Business are just a few examples of how the university facilitates research on social and economic development and community development in the greater Green Bay region and beyond. The University of Wisconsin-Madison is home to the National Center for Freight and Infrastructure Research and Education (CFIRE). CFIRE is a U.S. Department of Transportation National University Transportation Center with a multimodal research, training, education and outreach focus on Making Multimodal Freight Systems Work for Economic Recovery and Quality of Life. CFIRE has an annual budget of approximately $7 million. It facilitates the Mid-America Freight Coalition, a 10-state regional organization to cooperate in the planning, operation, preservation and improvement of multimodal freight transportation infrastructure systems, operations, and networks.